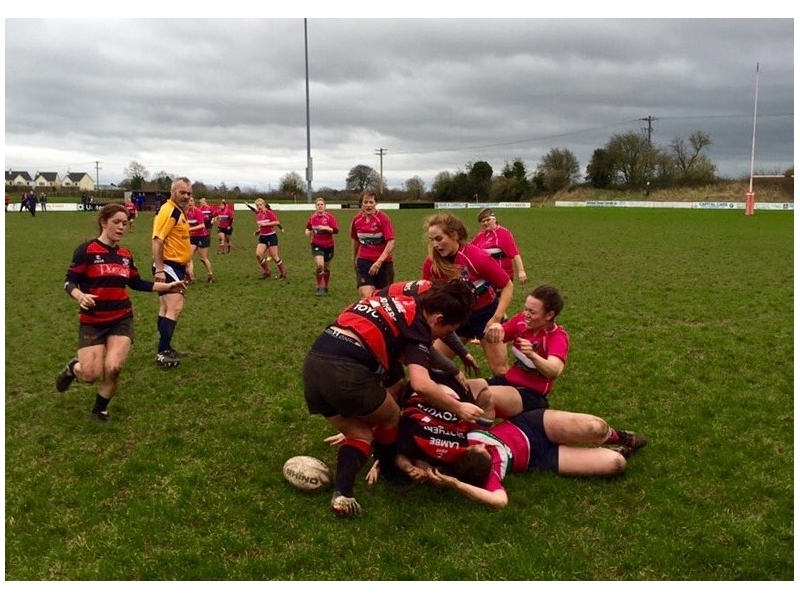 Another winning performance, without conceding a score was how the weekend ended for the Tullamore girls. Tullamore got out of the blocks early, taking the game to Suttonians, running hard lines, and winning rucks cleanly. Some excellent vision by out half, Pauline Keating, saw her break through a gap at the side of a ruck and sprint under the posts for a try which she converted herself after 3 minutes. This may have led to false sense of confidence amongst the Tullamore supporters, as Suttonians had no intention of lying down, and had some periods of dominance of their own. Indeed they would have scored a try if it was not for some excellent cover defense by the Tullamore backs, with Jill Draper and Rose Dune standing out in particular. 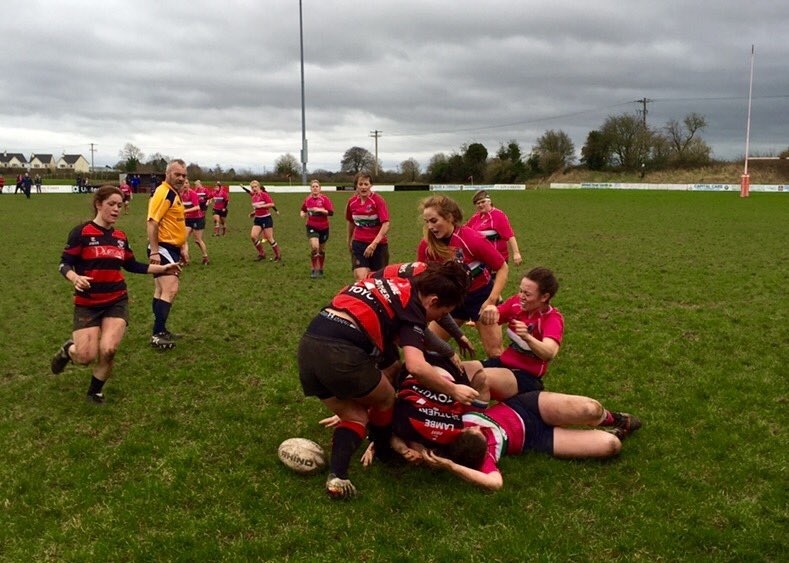 Tullamore conceded a lot of penalties at ruck time, and the penalty count was very high in favour of the visitors, which led to even more pressure on the girls in red and black. Just before the end of a very long first half, A well worked move, with good handling and running at pace saw Claire Currams increase her try tally for the season by running in a try in the corner at the clubhouse end of the pitch. Half time came, and there were some stern words form head coach Colin Hughes. The second half was going to be much tougher as the home side now had to play into the breeze, and Suttonians were gaining confidence with every blow of the referees whistle. Emer Phelans’ and Ciara Farrells’ powerful running put Tullamore of the front foot again, as they straightened the attack a number of times. Brigid Hyland had an excellent game at scrum half, as she had to deal with a lot of pressure from her opposite number at scrum time, and this gave the back line good go forward ball. Tullamore did not score again until the 70th minute, when Claire Currams once again was in a perfect position to dot down the ball, after crossing from 5 meters. The build up to this try was perfect example of when Tullamore are playing well, all the basics are done right, as the whole Tullamore team worked hard to recycle the ball a number of times, before going wide for the score. The final pass was given unselfishly by Alma Egan, who resisted the temptation to go herself, and made the correct decision. This was a good game for Tullamore, as lot of girls got a chance to put their hands up for selection. However a lot of work needs to be done to allow Tullamore convert all of their opportunities, and also to learn to play to the ref’s instructions, which should help reduce the penalty count. Wexford Vixens will be the next team to visit Spollanstown at 1pm next Sunday, so come up to cheer on the girls, and be amazed by their skill and work ethic. Ciara Farrell, Sarah Coffey (Aoife Molloy, 40), Alma Egan, Veronica Smyth Katie Murray (Katie O’ Brien, 40), Chloe Lowry, Roisin Feighery (Evelyn Browne, 20) Emer Phelan (Patrice Browne, 20 (Vicki Cobbe, 60), Brigid Hyland, Pauline Keating, Jill Draper, Grace Flynn, Claire Currams, Rose Dunne, (Eimear Daly 50), Claire Cantwell.